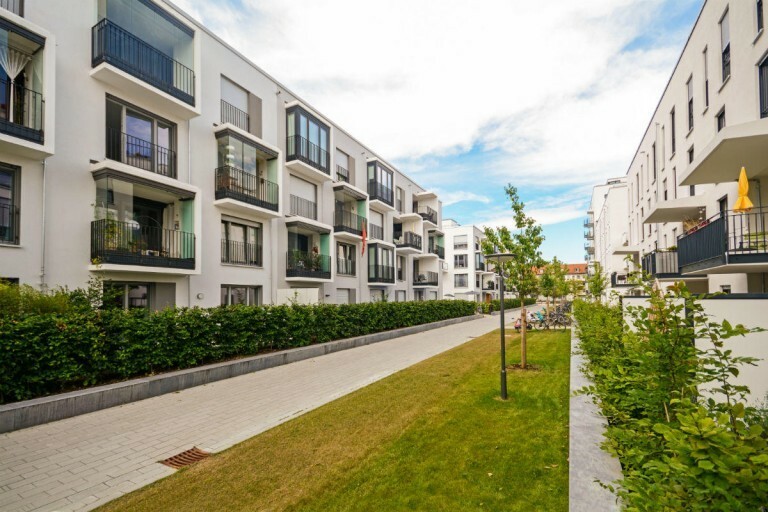 The condominium attorneys and HOA lawyers at Cowie & Mott provide legal representation and advice to condominium and homeowners associations throughout the State of Maryland and the District of Columbia. 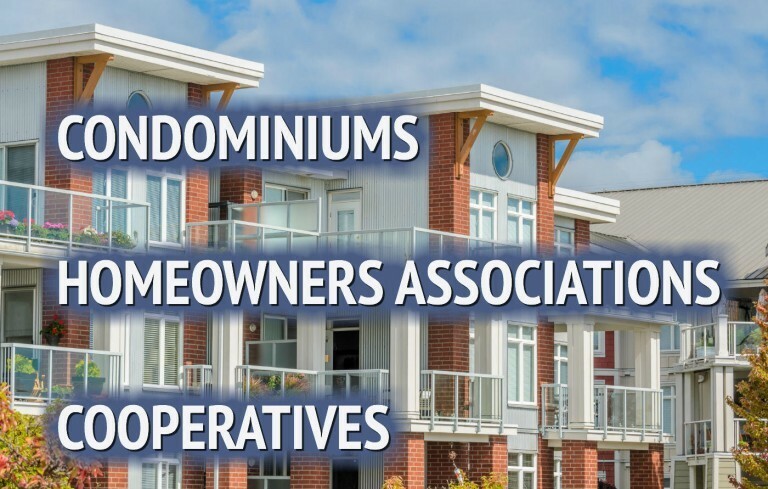 We are members of the Chesapeake Region and Washington Metro Chapters of the Community Associations Institute as well as the Delmarva Condominium Managers Association, the Maryland Multi-Housing Association, and the Property Managers Association. Cowie & Mott is not only able to handle the day to day legal matters of governance and business operations that face associations, but are also skilled construction, business and litigation lawyers that represents condominium and homeowners association on a regular basis in complex transactional and litigation matters. Condominium attorney T. Allen Mott is the Vice President and a member of the Board of Directors of the Community Associations Institute Chesapeake Region Chapter. Mr. Mott is well regarded for his representation of condominium and homeowners associations and served as lead counsel in a case where he obtained a 5.6 million dollar jury verdict in favor of a Maryland condominium association. Condominium Attorney Nicholas Cowie is the instructor of the Community Associations Institute course entitled “Resolving Construction Defect Disputes with Developers.” Mr. Cowie often drafts proposed legislation and testifies before the Maryland legislature on matters affecting homeowners and condominium associations. For example, Mr. Cowie drafted and led the effort to obtain passage of the Warranty Reform Legislation that extends warranty periods for Maryland condominium and homeowners associations in Maryland and worked to draft and obtain passage of the laws that strengthened the rights of associations in the transition process. 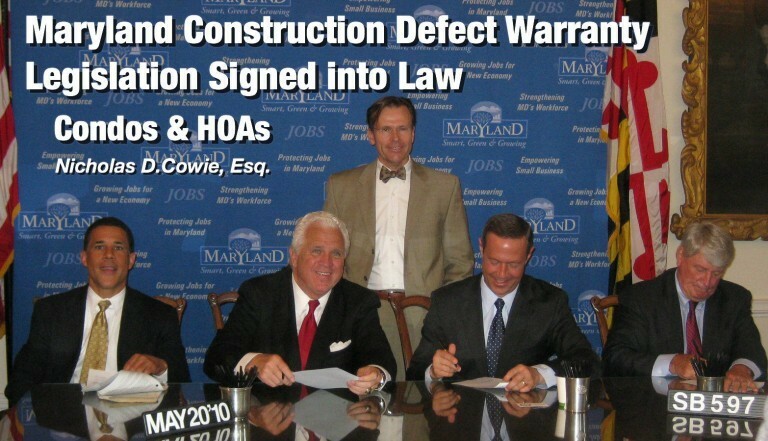 Mr. Cowie is the author of the Maryland Condominium Construction Defect Law Blog and served as co Counsel in a case in which a jury awarded 6.8 million dollars in favor of a condominium association. 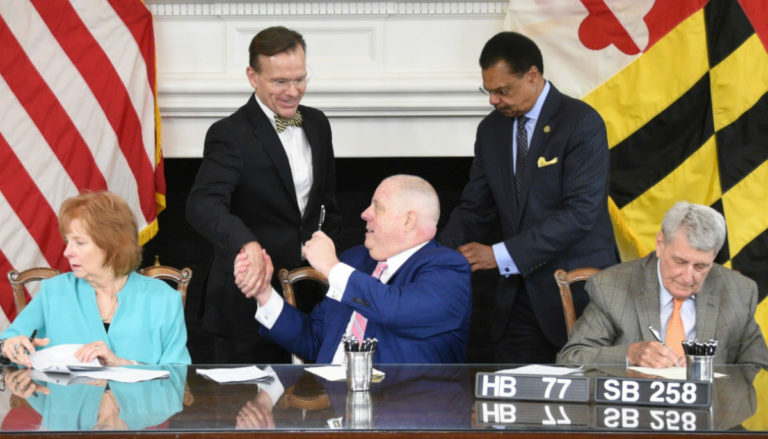 Nicholas D. Cowie, author of Condominium Legislation, shakes Governor Hogan’s hand at bill signing ceremony. 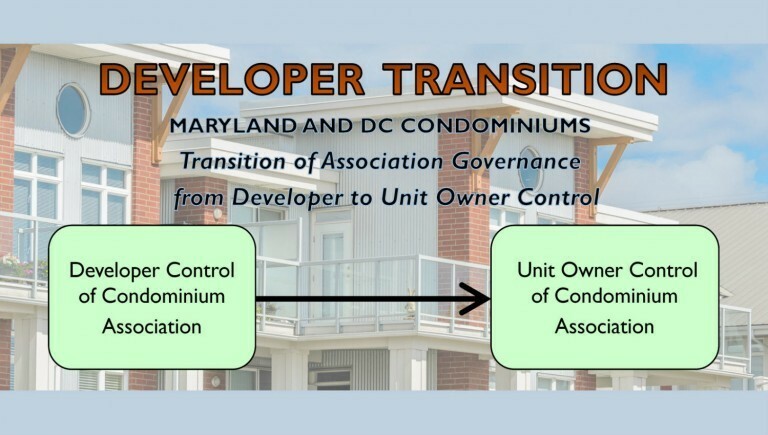 In addition to representing new condominium and homeowners associations in the developer / homeowner transition process, our Maryland condominium and HOA lawyers provide on-going legal advise and representation to our condominium and homeowner associations following the transition process. 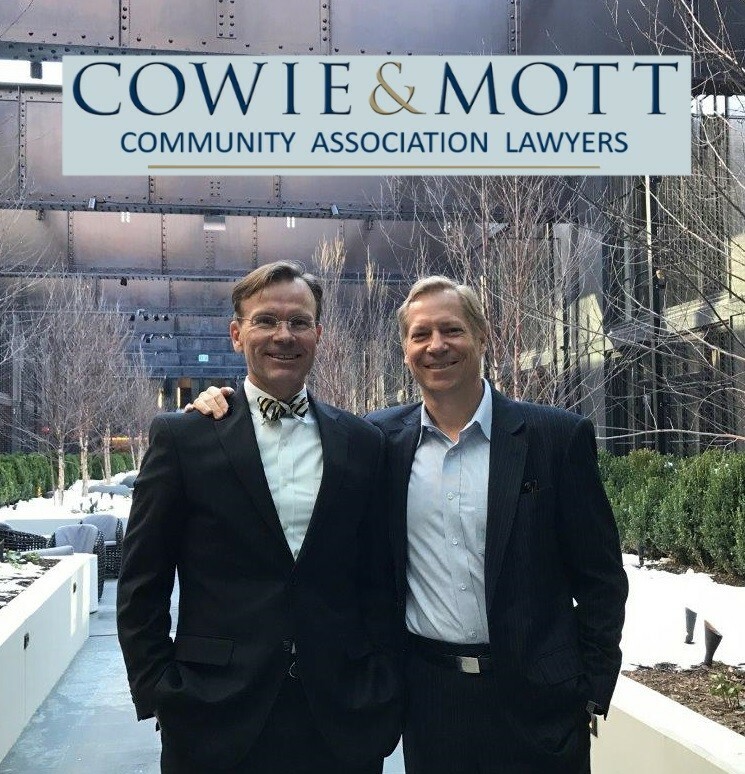 The condominium lawyers and HOA attorneys at Cowie & Mott provide legal opinions to community associations regarding architectural control, assessments, declaration & bylaw interpretation and compliance, contract negotiation, easements, governance (meetings, voting, proxies, resolutions, etc. ), insurance matters, liability and risk avoidance, maintenance, repairs, and replacements, reserve studies and transition studies, rules promulgation & enforcement, and unit owner disputes, litigation and contracts. The condominium association lawyers at Cowie & Mott, P.A. have long-term relationships with accredited condominium association professionals. We educate board members and homeowners on matters involving Maryland and Washington DC condominium law and represent the interest of the community association in reviewing and enforcing governing documents, providing legal opinions to board members, and negotiating contracts with vendors and service providers. 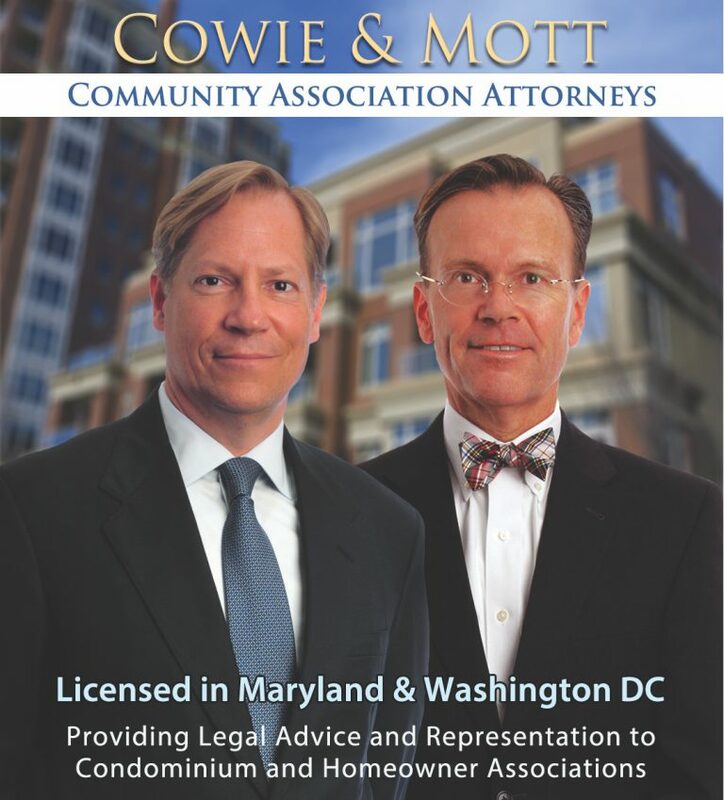 The community association lawyers at Cowie & Mott also represents homeowner association communities (HOAs) in matters involving Maryland and Washington DC law. For more information about our Condominium and HOA law practice in Maryland and Washington DC, please visit our dedicated website (MarylandCondominiumAttorneys.com) or contact a Maryland condominium attorneys and HOA Lawyer at Cowie & Mott to discuss your community association law issues in Maryland and the District of Columbia. Nicholas D. Cowie, author of Hose Bill 77 and Senate Bill 258, shakes Governor's hand at Bill Signing ceremony. 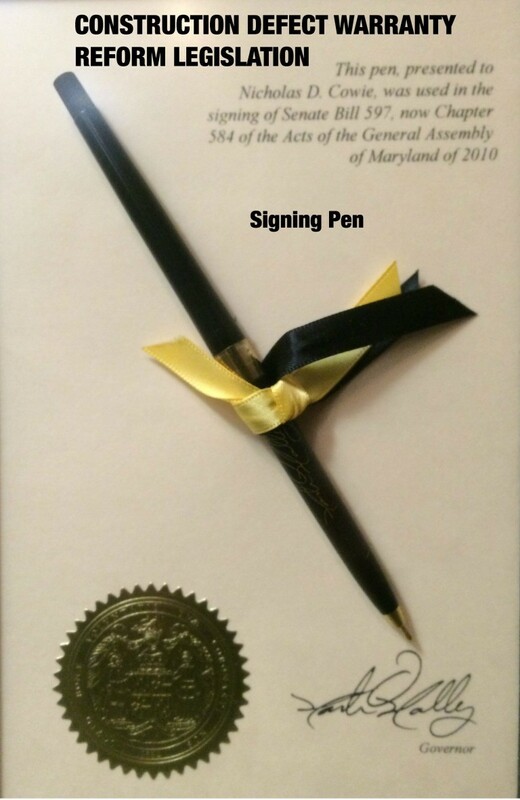 Nicholas Cowie at signing of Senate Bill 597, the legislation he drafted that extends Warranties for Maryland condominium and homeowners associations and protects condominiums from tactics used to defeat common element warranty rights.